Bournemouth have signed Wales midfielder Shaun MacDonald from Swansea City for an initial fee of £80,000, plus add-ons and a sell-on clause. The 23-year-old had enjoyed five loan spells at Yeovil Town but has agreed terms to join League One side Bournemouth on a two-year deal. MacDonald is now awaiting international clearance to complete the move. "It looks very likely there will be a deal done in the 24 to 48 hours," said Swansea boss Brendan Rodgers. The deal was originally reported to be worth anything up to £150,000 but Swansea announced on their website that they would receive an initial £80,000, as well as "add-ons and a substantial sell-on clause." MacDonald graduated through Swansea's centre of excellence and made his first-team debut in a League Cup defeat to Reading in August 2005. But the former Wales Under-21 captain, who collected a record 25 Welsh Under-21 caps, has made just 31 appearances for his home-town club, and only nine league starts, and was sent out to Yeovil on loan to gain experience. MacDonald, who had a year remaining on his contract with the Premier League new boys, has been told by Rodgers his first-team chances were "very, very limited". MacDonald had been battling with Leon Britton, Joe Allen, Stephen Dobbie, Kemy Agustien, Wayne Routledge, Scott Sinclair, Nathan Dyer, Mark Gower and Tom Butler for a place in the Swans midfield. 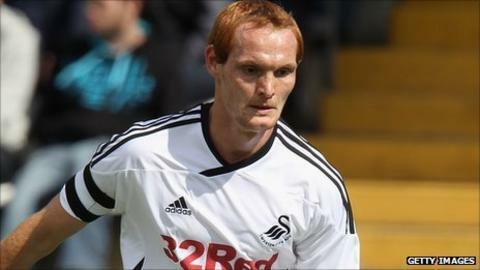 He will be the second midfielder to leave Swansea this week after Ryan Harley joined Championship side Brighton.